The signs of spring are all around us in Hawley. The weather is warming up and we’re ready to hit the hiking trails. If you’re planning a getaway to our picturesque region this spring, let us tell you about three beautiful waterfall tours worth visiting in the Poconos. And with our three-day Spring Waterfall Tour Lodging Package, we’ve taken care of all the details for your trip right down to the blanket you’ll need for your picnic lunch. Before you book your trip to the Pocono Mountains, you must download our Delaware Highlands Vacation Guide. You’ll be so glad you did! This guide is free and packed with information about things to do while you’re here. From outdoor activities like waterfall tours to restaurants you’ll want to visit, upcoming festivals and Ledges Hotel exclusives, the guide is just what you need to travel the area like a local. When you book our Spring Waterfall Tour Lodging Package at Ledges Hotel, we’ll get you all checked in and then send you on your way to enjoy a drink out on the deck. To ensure your day begins on the right foot, you will enjoy breakfast the next morning at our sister property, The Settlers Inn. After breakfast, make your way to Hawley Silk Mill where you will grab your picnic lunch essentials from Cocoon Coffee House. Their delicious lunch items are affordable and fresh! At this point, you will be ready to head to your first destination: Childs Park. Childs Park is open to the public free of charge. There you will find three waterfalls: Factory, Fulmer and Deer Leap. The trail there is a 1.5-mile loop alongside Dingmans Creek. The next must-see waterfall tour is Dingmans Falls. Dropping more than 130 feet, Dingmans Falls is the second highest waterfall in the state of Pennsylvania. A short trail leads to an observation deck overlooking the falls. If you choose not to follow the trail, there is an observation area at the bottom of the falls. The best time to visit Dingmans Falls is after a heavy rainfall and during the week because the area becomes quite busy on the weekends. Next stop is the cascading three tiers of Raymondskill Falls. Raymondskill Falls is the highest waterfall in Pennsylvania. 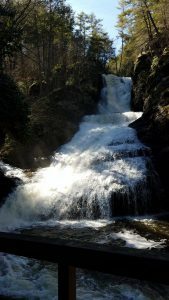 The Raymondskill Falls trail is an easy hike at only 0.3 miles. The trail is steep and it’s only one-way. There is an upper and lower viewing area, so be sure to bring your camera. Your day will end at the stunning Shohola Falls which measures 75 feet across. Hawley Offers Many Area Activities in Addition to Waterfall Tours! Day 3 of our Waterfall Tour Lodging Package begins with another delicious breakfast at The Settlers Inn followed by a day spent exploring the beautiful town of Hawley. You can do a little shopping or continue to explore all the outdoor recreation Hawley has to offer. Did we mention that our Waterfall Package also includes a $75 voucher to use at Glass wine.bar.kitchen and a $25 voucher to use at Cocoon Coffee House? We are lucky here at Ledges Hotel because we are situated right on Paupack Falls. The majestic falls can be seen from the hotel’s great room or from the multi-tiered decks outside. Two of our guestrooms, 202 and 204 in particular, have great views of the falls, as well. All of our rooms include the finest amenities, including luxurious Green Earth bamboo towels, flat screen TV, free WiFi, a complimentary day pass to Lake Region Fitness Center located in the Hawley Silk Mill, and more. When you travel to the area, we would love to host you in one of our rustic-modern rooms or suites. Let us help you start planning your springtime getaway to the Pocono Mountains. We look forward to hosting you soon!